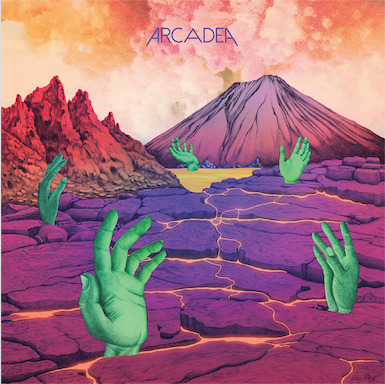 Los Angeles cosmic synth/psych act Arcadea have announced the details of their debut, self-titled album. Set for release on June 16th via Relapse Records, the trio tells a unique story of a future 5 billion years from now where galaxies have collided, leaving catastrophic disorder in its wake as war is waged among gods and planets, and Arcadea reign supreme as the last surviving space wizards since the final extinction. Fans can pre-order the album by clicking here. The artwork and track listing for Arcadea can be found below.